the Lambrecht Family - in Azusa - since 1946! Cardinal Church Furniture's Mission is to Design, Manufacture and Install Outstanding, Fine Crafted Church Furniture Solutions for your SEATING and PLATFORM FURNITURE needs. Our first step is to meet with you and your committee - LISTEN to YOU - and - present FREE EXPERT PROJECT CONSULTATION. New Pews - Upholstered or Wood. New Church Chairs - Interlocking - Stackable, Wood or Metal frame. Platform & Chancel Furniture, Standard & Custom designs. Factory Re-Upholstery & Re-Finishing of exsisting pews. We Install What We Manufacture! 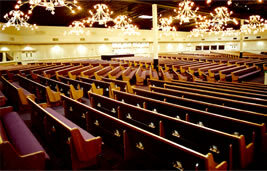 At Cardinal Church Furniture we proudly offer the highest quality Church Furniture and Carpet. We don't stop there, we include full service delivery and installation as well. We do not ask for or require "Church Help" to install your pews. Our factory trained professional crew will perform all installation work using company owned trucks and installation equipment. This ensures that your furniture is delivered, unloaded, assembled, lined-up and installed properly and per specifications. Cardinal Church Furniture is California’s one and only choice for the best in custom church furniture. Our expert staff specializes in pews, cushions, padding, chairs, benches, podiums, rostrums, flooring and more. Cardinal Church Furniture has built a long-standing, esteemed reputation in the state of California. Our family owned-business was started in 1946, and the fine craftsmanship of the Lambrecht family has withstood the test of time. We use only the finest solid lumber to make sure our church furniture is the absolute best. Quality is always our top concern at Cardinal Church Furniture. Our service begins with a free consultation in which our staff will meet individually with you. We will present you with the best and most affordable choices possible. Our mission is to find out exactly what you want and then put our expert services to work for you. Cardinal Church Furniture offers in-depth services that will keep you free from worry and full of satisfaction. Our process begins with the design stage in which we will help find the right design for you. We will even go as far as providing you with the most effective color coordination patterns. Next comes the manufacturing stage, where we will build your order to your exact specification. Finally, we will come directly to you and properly install your church furniture. New pews can breathe new life into existing congregations and also help usher in new members. That is why we make sure to do each job right. That means not only producing quality pews, but ones that are also appealing to the eye. Cardinal Church Furniture offer the very best in new pews, both upholstered and of the wood variety. All of our pew bodies are available with an ergonomic back upgrade. And all of the lumber we use comes from within the state as part of California’s sustainable forests. Only the very best lumber goes into each of our pews. Our talented design team can custom make specialty pews to fit your church. We not only provide custom designs but also specialize in making mitered pews, mission style pews and open pew bodies. If you are not looking for new pews and would rather upgrade the ones you have, Cardinal Church Furniture has a solution. 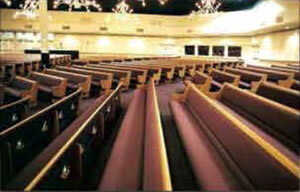 We can re-upholster or re-finish your existing pews and have them looking brand new. There are many upholstery options to choose from including factory re-upholstering. Every job includes the use of the highest quality and density polyurethane foam as well as the strongest fabrics. We even provide creative cushioning so that your pews provide the utmost comfort. Once we are finished with your pews, they will look like they just left the showroom. There are many options to choose from when choosing from our wide selection of pew chairs. We have reversible and attachable seat cushions along with attachable back cushions. There are also multiple wood-finish options to choose from. Our church chairs are available in interlocking and stackable varieties. We also offer church chairs with either a wood or metal frame. We give you the option of mixing and matching the styles that are best for your congregation. Standard and custom designs on platform and chancel furniture is one more excellent service available to our customers. Cardinal Church Furniture can even custom make alters to fit your liking. If you are looking for a new carpet or church floor, Cardinal Church Furniture has everything you need. We invite you to pick out the fabric and color combinations that will give your church a little extra pep. And when it comes to the installation process, we will take care of the pew removal, carpet removal as well as the floor preparation. Our team can renovate your church and have your floors looking shiny, spotless and in showroom condition. Seeing is believing, and the proof of our excellent craftsmanship is right here for you to see. Check out our online before and after photos of our previous jobs. We are confident that our work speaks for itself. Cardinal Church Furniture offers other church necessities such as kneelers, book holders and modesty rails. There is no order too big or small as Cardinal Church Furniture values every customer equally. That kind of standard has enabled us to maintain a long list of satisfied customers dating back to the 1940's. Our talented team has been recognized for various award-winning installations. It is with high precision and care that we continue to be the very best in the state of California. Cardinal Church Furniture services a wide range of areas. We offer the top quality church furniture Los Angeles and also provide the best pulpit furniture in San Diego. But our service area is not limited to those two cities as we accommodate the church furniture needs of everyone in between for more than a half century. Our friendly sales and design team are waiting to take care of all your church furniture needs. Come to Cardinal Church Furniture, and you will recognize the same faces. Our family-run operation has been passed down from one generation to the next. In all that time, we’ve come to achieve great success by upholding our high standards along with an ongoing commitment to excellence.